Interesting to see Simon Rattle's newly released cycle of the Brahms symphonies with the Berlin Philharmonic selling today in leading independent retailer Prelude Records, who are not known for their discounting, for £19.99. Presumably because the recordings were made at live concerts, EMI released the four symphonies on 3 CDs with no fillers, which gives a playing time of just 42 minutes for the CD of the Fourth Symphony on its own, which is short measure even for an LP! At £19.99 the price per Berlin Phil CD is just 80 pence more than a Naxos disc in the same store featuring the Camerata Transylvanica. I am trying to work out whether that is an example of reputation inflation or deflation. 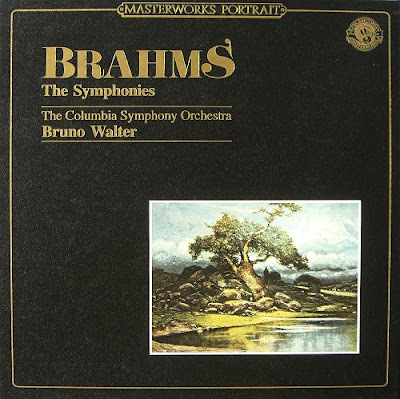 Talking of LPs, my header image is my 3 LP box of Bruno Walter's Brahms stereo cycle from the 1960s (He made an earlier mono cycle with the New York Philharmonic). My set contains Dutch pressings from the early 1980s, and, unlike the American Columbia pressings of the same period, they still sound magnificent today. Both of Walter's cycles are available on CD if you must. Other 'old school' Brahms that I return to often is George Szell's cycle with the Cleveland Orchestra, again from the 1960s but available on silver disc. Karajan should also receive an honourable mention; he was a truly strange individual, but his Brahms was quite superlative.For 'new school' Brahms, it is hard to beat the venerable Charles Mackerras' account of the symphonies with the Scottish Chamber Orchestra on Teldec. With so many exemplary recordings from 'old generation artists' in the catalogue (and often in outstanding analogue sound to boot) is it surprising that EMI are forced to discount Rattle and the Berlin Phil's interpretations so heavily from day one? - over on amazon.co.uk the 3 CD set is just £16.98 post free. More on the frustrations of the classical recording industry here. I grew up (although that’s debateable) with the Szell-Brahms. I also had both Walters. Kertesz doing Brahms was astounding, but one of the best modern sets of all times was Solti’s, one of the first to use all the repeats. Other great individual performances: Horenstein’s Brahms 1st, and Fritz Reiner’s Brahms 4th, both done originally for Reader’s Digest. The Reiner turned out to be his last recording session. It's difficult to understand why anyone would record these (or a Mahler or Beethoven cycle) anew with the prospect for any significant sales virtually nil, and such time-tested riches ubiquitously available. What we could use: a few more goes at a Sibelius and Bax series, but perhaps the same ego gratification is not to be had from these starker cycles. To your Brahms list I would submit Kurt Sanderling's with Staatskepelle Dresden. Sir Adrian Boult doing ANYTHING is worth while. Interestingly, his Reader’s Digest recordings (originally appearing in the box set Festival of Light Classical Music, another great childhood memory) were re-issued on CD. There is a mono recording of The Planets by Boult, as well as Elgar’s 2nd (one of Boult’s many), that were issued on EMI’s Great Recordings of the Century which are unparalleled in drama and even violence. My first LP of Elgar 2 was a Classics for Pleasure disc Sir Adrian recorded with what was then the Scottish National Orchestra in 1962. John, you mentioned the Bax symphonies. Another composer whose symphonies should be available in more versions is Michael Tippett. Colin Davis' pioneering recordings for Philips with the LSO were quite superb, I have them both on vinyl and CD. But, alas, their CD transfers only had a short catalogue life. Richard Hickox's cycle for Chandos from the 1990s are very good, as are the composer's own accounts for the BBC of the quite magnificent second and the 'what was he smoking?' fourth symphonies (both now on NMC). But surely there is room for more versions? Yes, Tippett's symphonies are variable in quality. But that hasn't stopped those of Mahler and Shostakovich being grossly over-recorded. I don’t find this symphony so “out there”. In fact, as he was getting older, I found Tippett getting more conservative, “respiration-sound-loops” notwithstanding. The argument as to whether or not provide ANOTHER Symphony cycle by the big composers is complex. If we went by the “no more big cycles” aegis, then we wouldn’t have John Eliot Gardiner’s Beethoven Cycle or Jaap ter Linden’s Mozart Cycle. On the other hand, cycles by the lesser-appreciated composers are a good idea, but we tend to, rightly or wrongly, want to stick with the specialists. For example, a Dvorak cycle by Kertesz or Kubelik, or Talich . How about another complete cycle of Havergal Brian Symphonies? Or, while we’re at it, how about more esoterica with promise such as Symphonies and Sacre music of Franz von Suppé? Surely, it’s time to “rehabilitate” certain potboiler composers as well. David, you are right. I have just listened to Tippett's Fourth again (and yes, I did sweep the leaves in the garden as well this afternoon) and I was being unfair. Although the coupling of the Suite from 'New Year' on the Richard Hickox recording is definitely 'wacky backy' music. I also have the LP of Solti's conducting Tippett's Fourth Symphony with the Chicago Symphony who commissioned it. There is a lovely photo of Solti and Tippett on the cover. That recording seems to have disappeared from the catalogue a long time ago. The coupling is Tippett's Suite for the Birthday of Prince Charles which, I am told by someone who tried to programme it in the royal presence, Charles hated. Which must make it a very good piece of music. Dave, you are a man after my own heart. I’ll take Tippett over anything the Prince likes anytime! I shall always cherish my own personal full-score autographed copy of Crown of the Year, which deals with a far more interesting topic than the Crown Prince that’s for sure! Pliable, my eye is caught in the discussion above by the mention of the Sir George Solti LP coupling of Tippett's Symphony #4 and his 'Suite for the Birthday of Prince Charles'. Interestly, the [later] CD coupling features the Tippett Symphony #4 and the world premiere recording of Tippett's late song cycle 'Byzantium' -- with Faye Robinson (although apparently initially intended for Jessye Norman). Both the Chicago Symphony and Carnegie Hall commissioned this late, major song cycle for their joint 100th anniversaries. (I remember once trying to track down the score to Tippett's 'Byzantium', but in the pre-internet day being forced to settle for Tippett's African ecological-inspired score to 'The Rose Lake', which I found a bit disappointing, incorporating as it did passages from the great 'Mask of Time' oratorio (commissioned, I believe, for a very significant Boston Symphony orchestra 125th anniversary commissioning project). Garth, the discussion referred to the Solti Decca recording of Tippett's Fourth Symphony, which is coupled with the Prince Charles birthday suite.